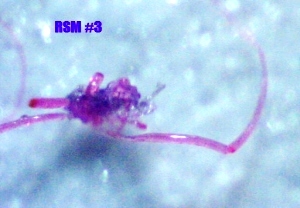 This page was compiled as a guide to the many varying types of Morgellons fiber specimens that I have found thus far. 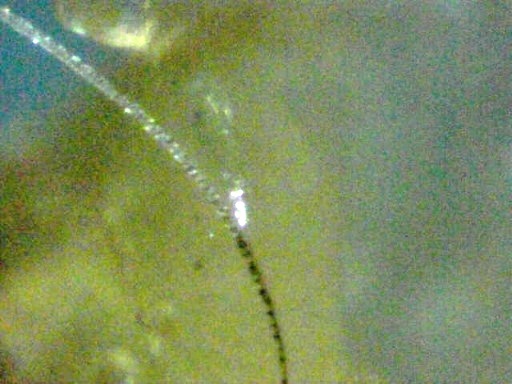 More detailed information is presented on some of the specimens in the Photo Journal and at other headings at the Morgellons Exposed website. 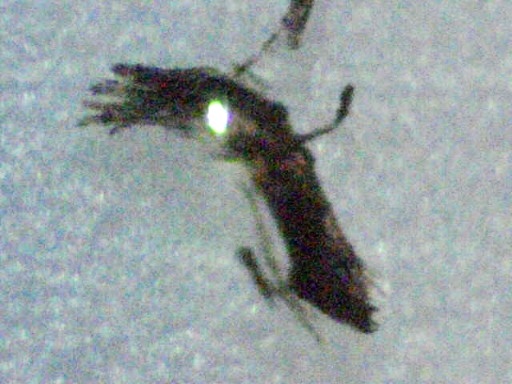 Other researchers may have additional specimens to those I have discovered. 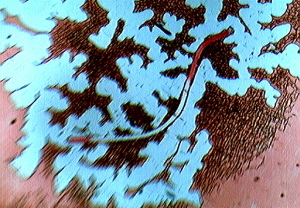 This disease has variations from person to person. 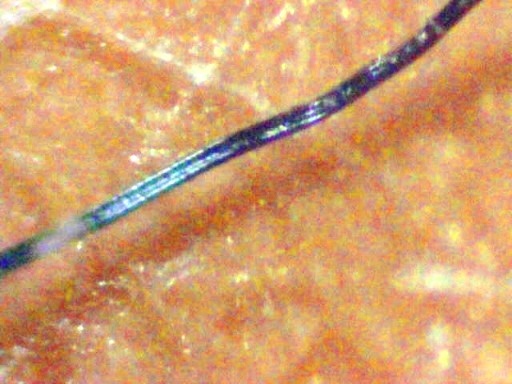 There are many different kinds of fibers involved with Morgellons disease. Each type has it's own specific purpose. This is why I have come to the conclusion that a complex system of wiring is taking place in human beings. The chemtrails, tainted food, inoculations, and clothing fibers are an attempt to transhumanize us or to simply reduce our life span. I suspect it is both. 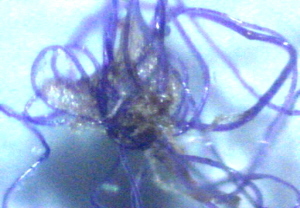 Blue round fiber that will not burn (pre burn) will become a "golden head" if subjected to butane flame for 30 sec. 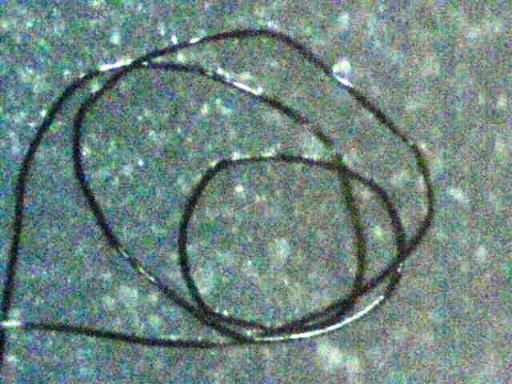 Blue grooved fibers found with concave center have emptied their payload in the body and are now empty "golden head" type fibers. 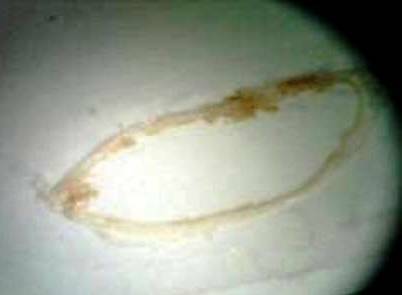 Casing is non burning but "golden head" will not form in burn since inner core is now empty. 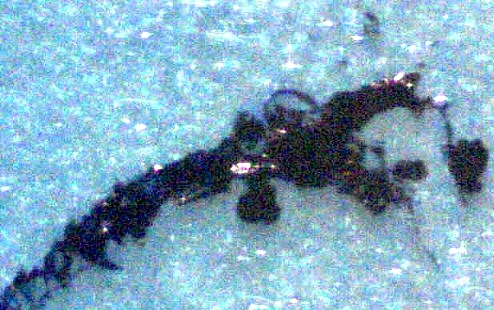 Burned Specimen from red gel encased blue fiber. 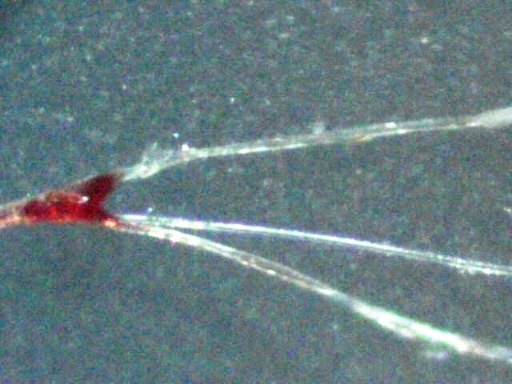 Red gel falls away in strips blue fiber inside turns clear after burning. 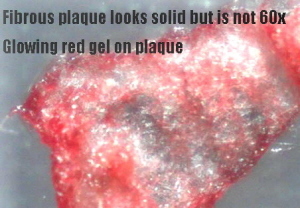 Pigment is on the inside. 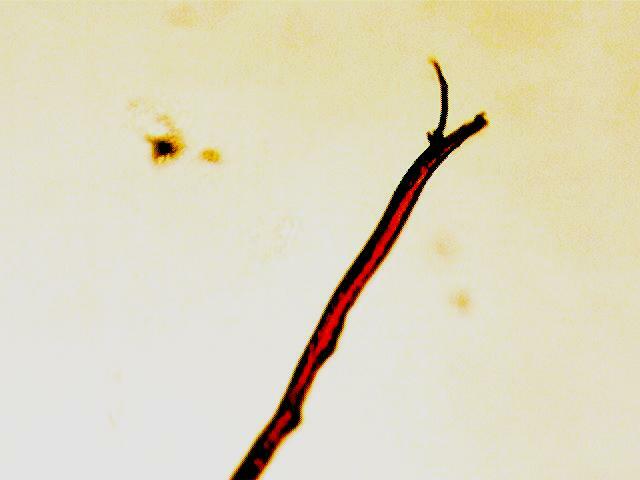 Red gel encased blue fiber. 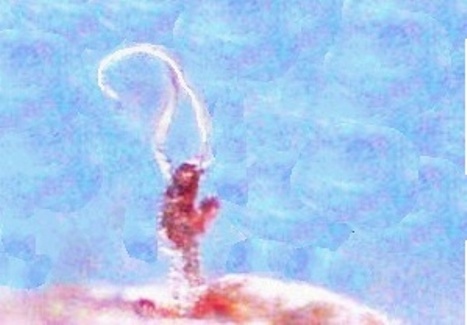 Head appears upon 30 sec. 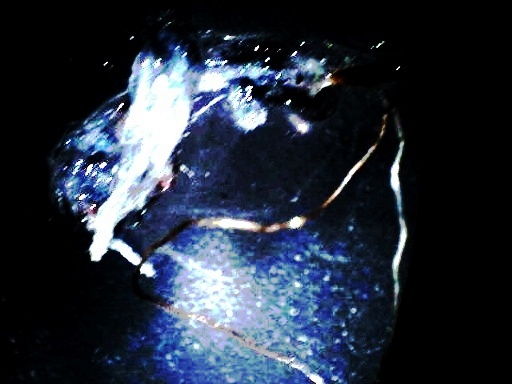 butane burn but is not a "golden head" but dark brown. 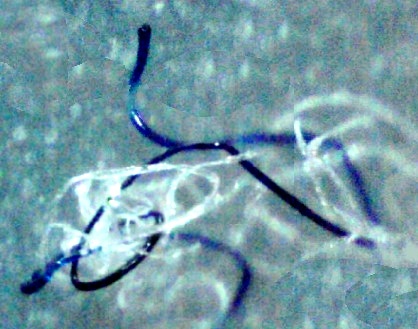 Fibers containing bundles of clear fiber- optic wires. Casing unravel like a barber pole. 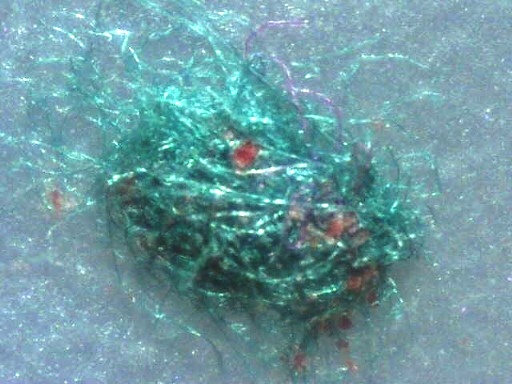 Coarse blue fiber with balled end, burnable. 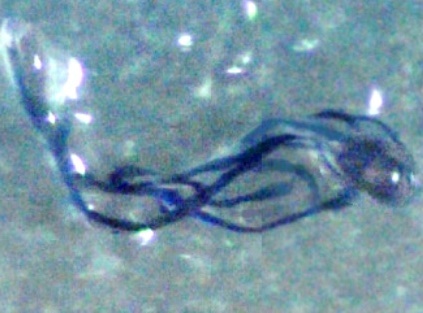 Cluster of blue, curved, tube fibers attached together at one end. 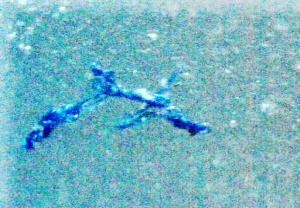 Inky blue cluster growing fibers, rare. 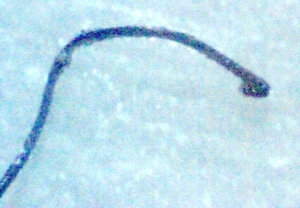 Blue fiber with clubbed end. Rare. 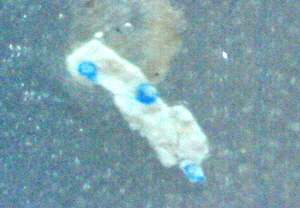 Blue and clear fiber combination, with pigment on the inside, rare. 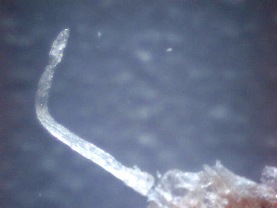 Clear, smooth fiber optic-type fibers found in bundles, small diameter. 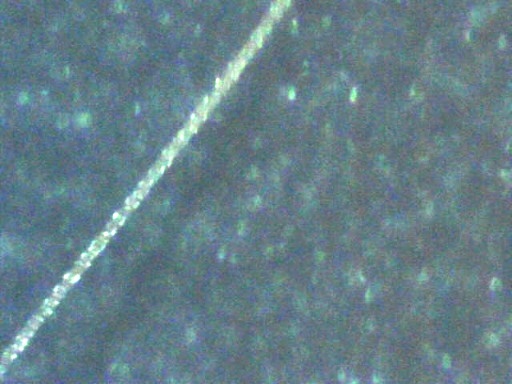 Large diameter fiber optic-type wires as found in this Nano Communications Array. 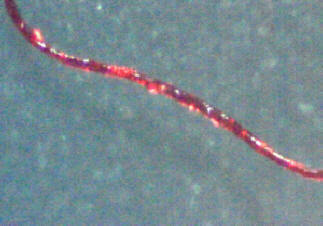 Large Fiber optic-type tubes/wires that branch due to presence of red glowing gel on the outside . 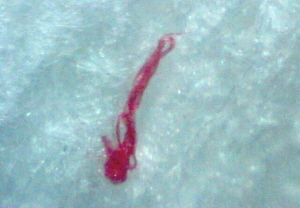 Large flat clear fibers growing from red glowing gel. 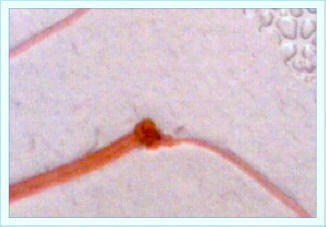 Flat, bent, fibrotic strands are less clear fibers. 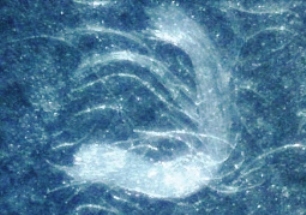 This piece is entirely made of entwined fibers that formed a solid-looking plaque. 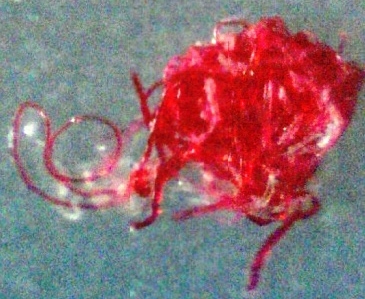 Red gel is nearly always involved with the growth of all types of colorless fibers. 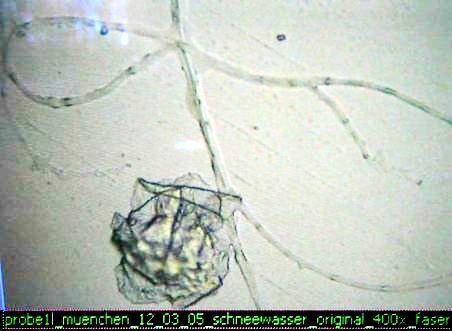 Each amoeba form has one clear antenna-type fiber. 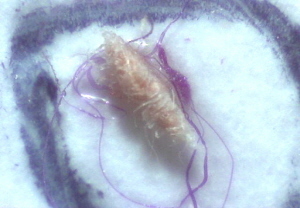 This cluster of of fibers came from a sore in my gum tissue. 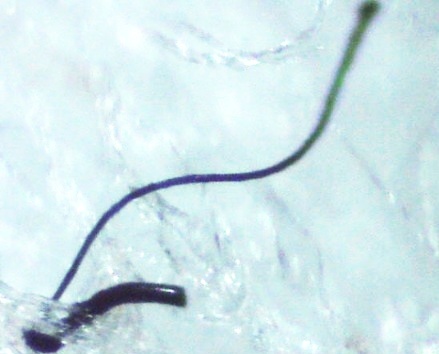 I found these fiber stuck together in this mass. 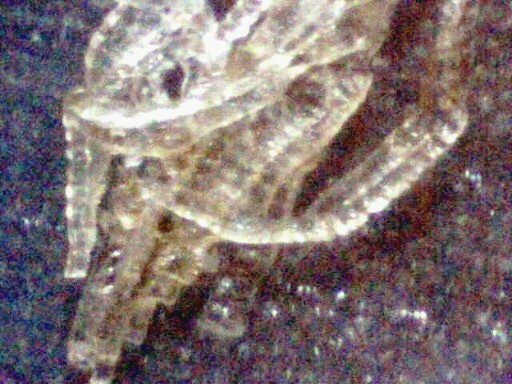 I pressed down on the fiber mass in the previous photo and it separated into these ridged fibers as seen here. 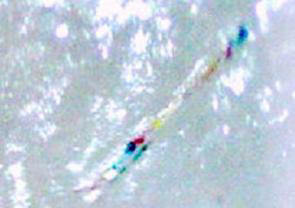 Multi fiber tissue in parallel rows from gums taken later from the same area of gums where I got material in photos 9 & 10 above. 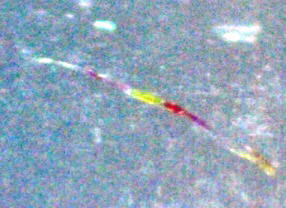 Not really clear but iridescent. 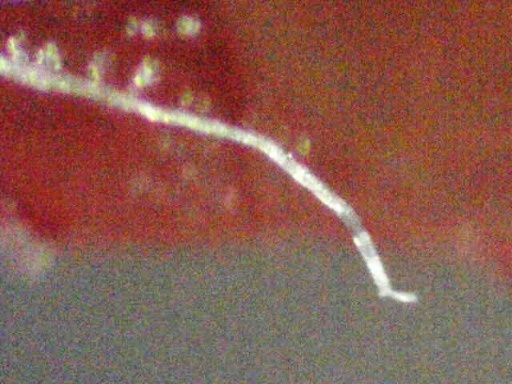 The goo/gel itself makes it's own self constructing fibers. 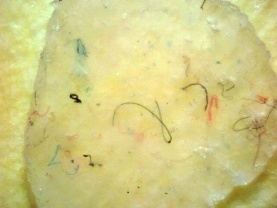 Many instances of fiber growth directly out of the goo. 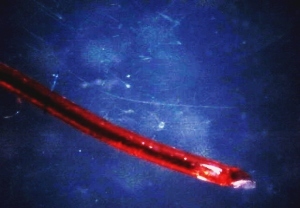 Red glowing gel fiber mass. 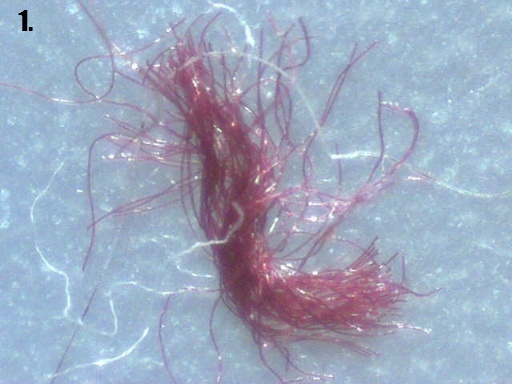 Early find 1999 double red fiber with rounded end and single strand growth. 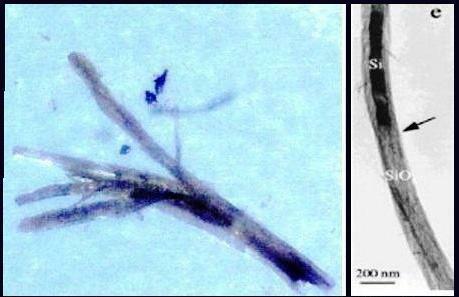 One time find 2001 red fiber cluster fibers did not burn. 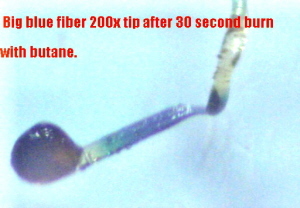 Red fiber from bundle in photo #3 burn tested for 30 seconds with butane flame. Results did not burn, payloaded. 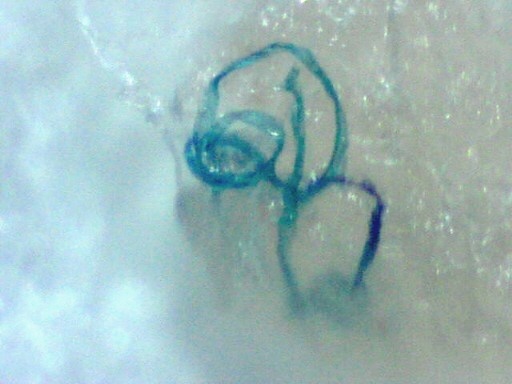 Red gel fiber with blue fiber growing inside. 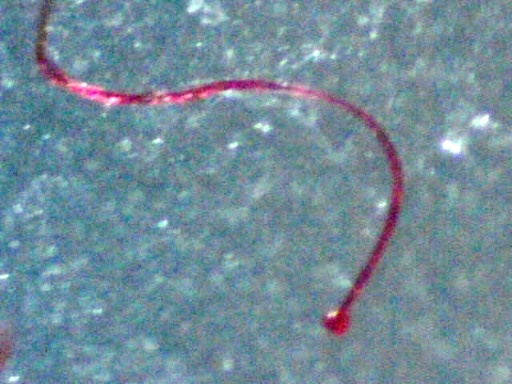 Red gel fiber with ball at the end. 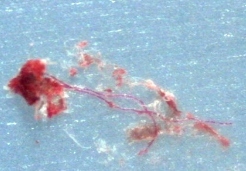 Red fibers attached to crust from top of lesion. 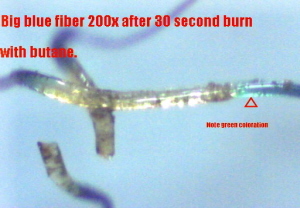 Burnable flat fiber. 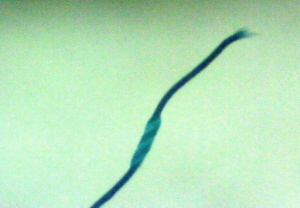 Frequently found as single strand with blue strand. 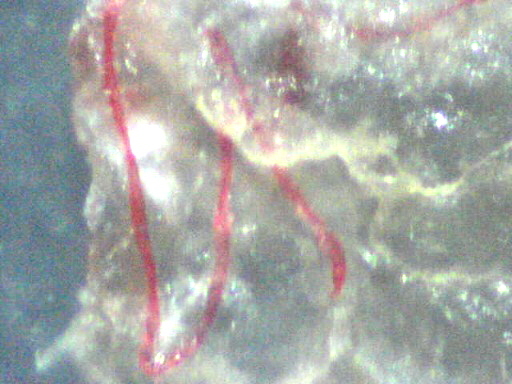 Red fibers in gel cluster with crust small red fibers . 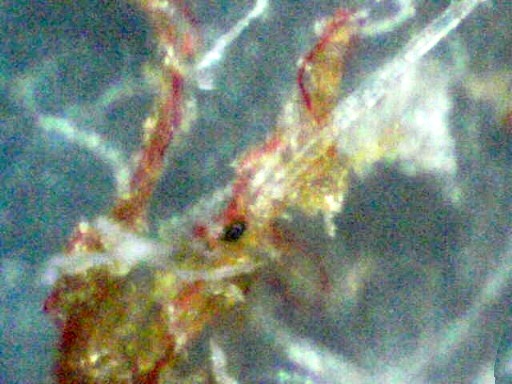 Half of a fiber pod containing red and other varieties of fibers. 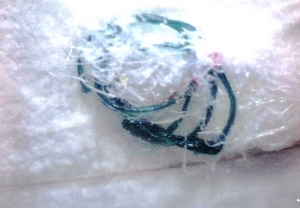 Round Green fiber more recently found in past 2 years. 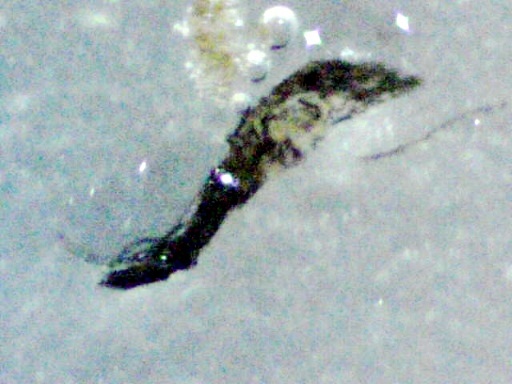 Large round teal strand from inside of pod from Michigan lady. 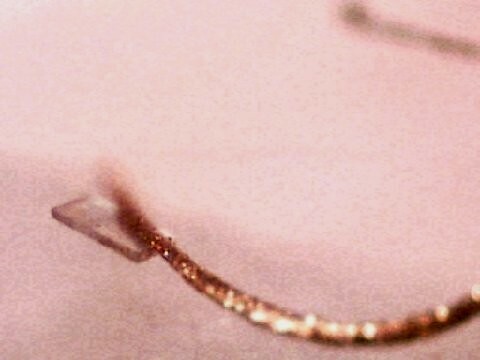 Copper colored metallic strand from Michigan woman. This one time find I call a rainbow fiber. It is the only time I have seen the color yellow in any fiber except for the one in next photo, #8 which only has a tiny amount. 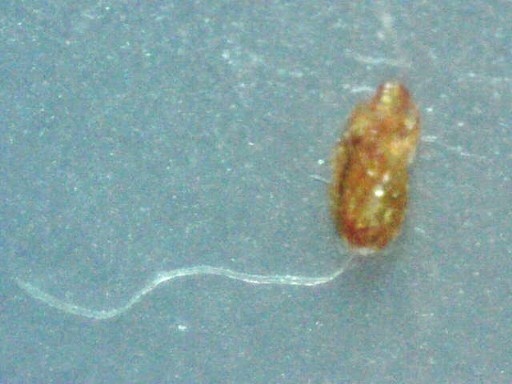 This fiber is also unique and has multiple colors on it. 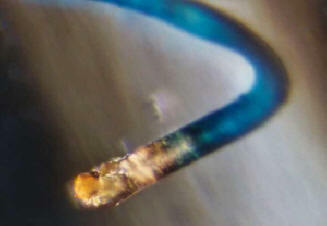 This huge glassy fiber was found on the scalp of a Texas lady. 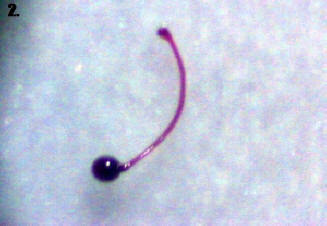 I call this specimen a "sprite". 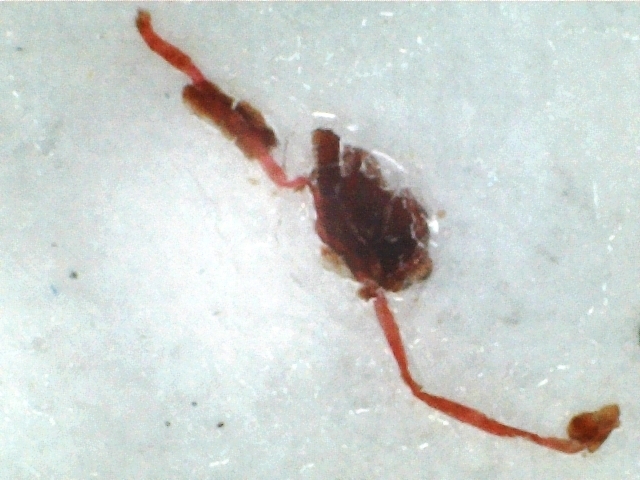 It is comprised of red glowing gel and fibers that surround a lesion below the healthy tissue nearby. 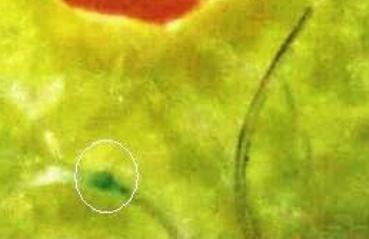 When the lesion is threatened these sprites turn into new secondary lesions. 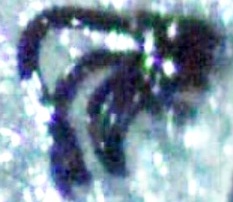 Several sprites can surround one lesion. 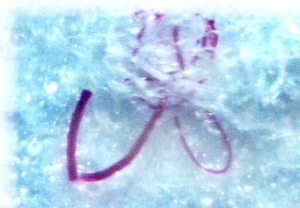 Researcher Blue found this fiber drawing in blood on a slide he made. 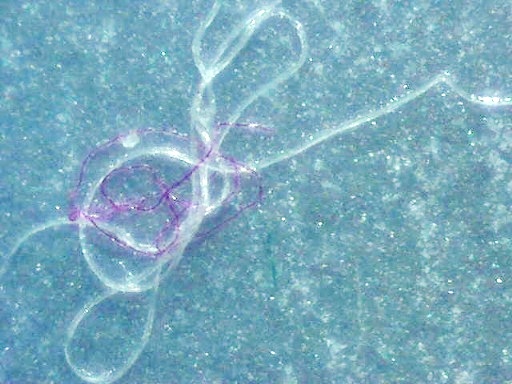 The Blue Circles that you see on this plaque are actually blue fibers formed into a circle. I removed the circle at the bottom and found this out. 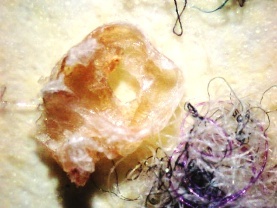 Circular fiber from perimeter of lesion is thick and tough. 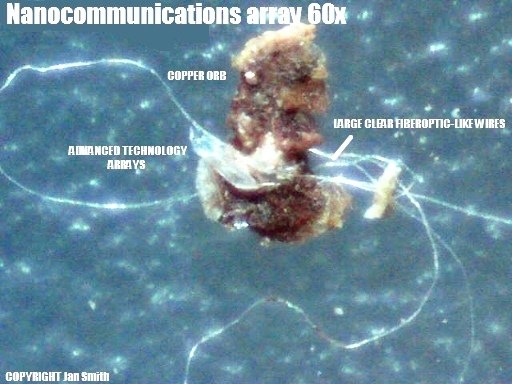 This fiber was sent to a researcher in 3/2007 and was lab scanned for Project FMM . 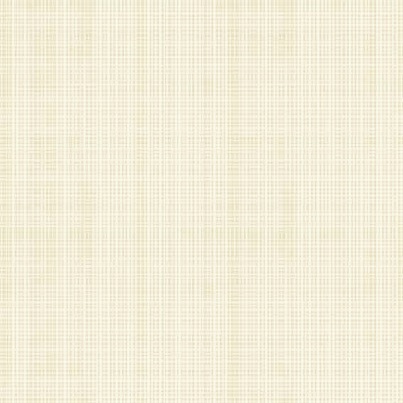 See readout here. 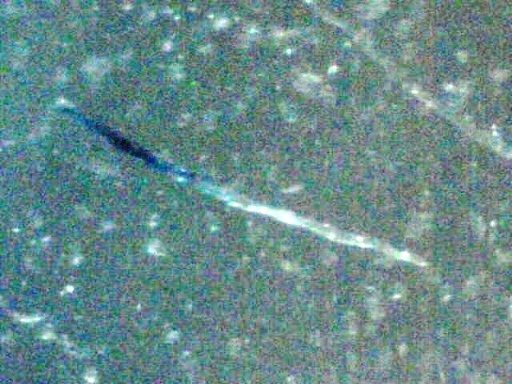 This tubule configuration is a blue/violet color. 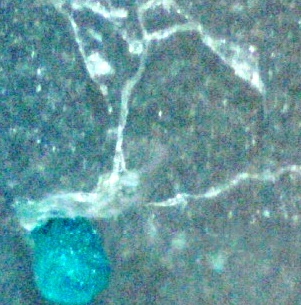 Tubule cocoon is in the center. 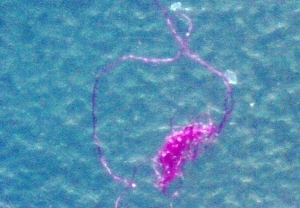 Tubule colors vary from purple to violet to pink/red. 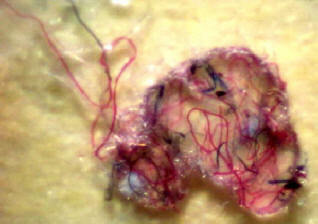 I have found other purple and pink fibers which are usually wrapped around crusts or other fibers. 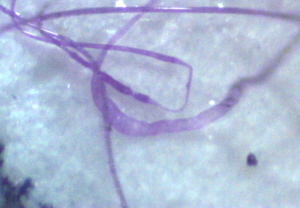 These are flat and irregular and look to be deflated tubules. 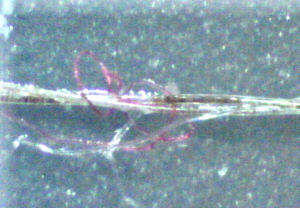 The purple and pink fibers appear to be wrapping around other fibers on the outside. Pink fiber wrapped around sugar snakes. 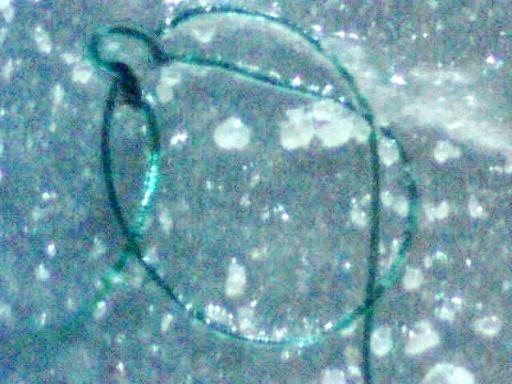 Fiber strand containing eggs (possibly lab created insects) from other researchers. 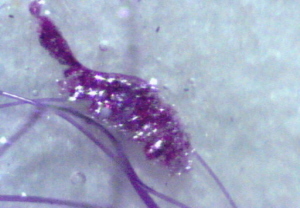 Glittery fiber with tail. Unknown donor. 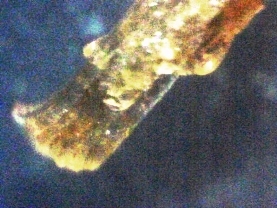 Close-up of hexagon fiber. 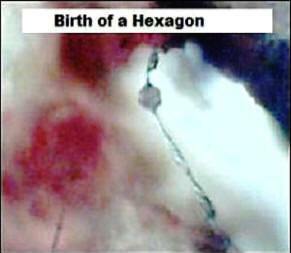 There are actually 2 hexagons in this fiber. 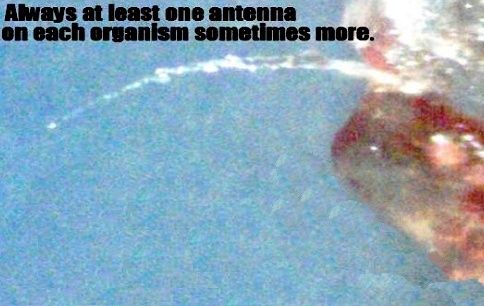 There is a tiny start of one to the right of the larger one. 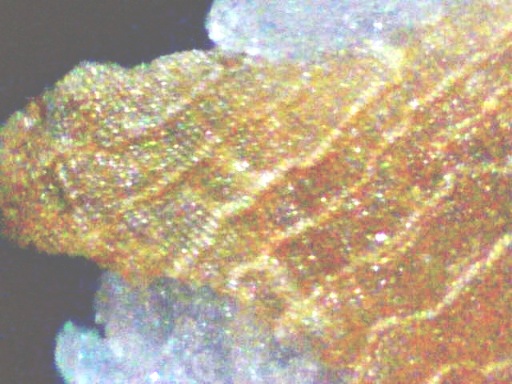 Hexagons grow in clear fibers. 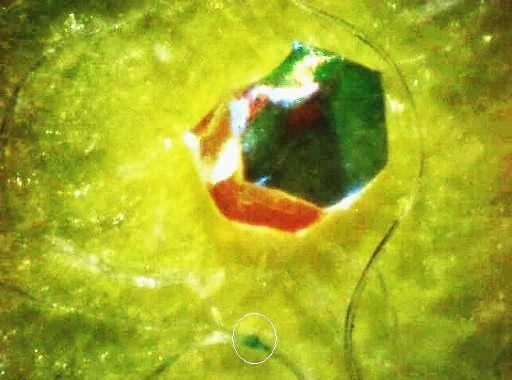 Large Hexagon growing inside a clear fiber from Ruth in CA. 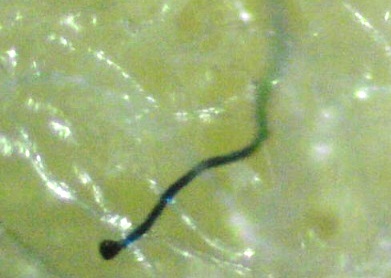 This is a multicolored fiberball from the inside of a pod. 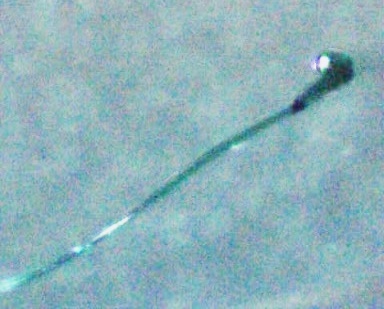 Half of the pod is shown. To learn more go HERE from Michigan lady. 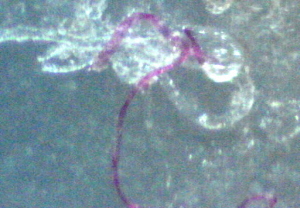 This is a developing pod with fibers and small dots of multiple color that will become fibers when mature. 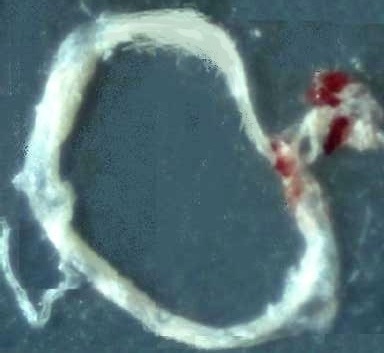 This is how fiberballs form. 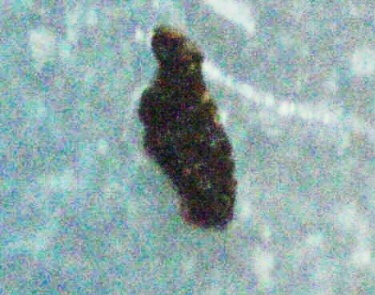 Specimen from Michigan lady. 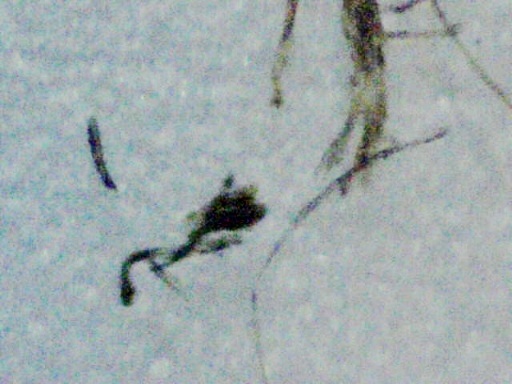 Black round fibers. 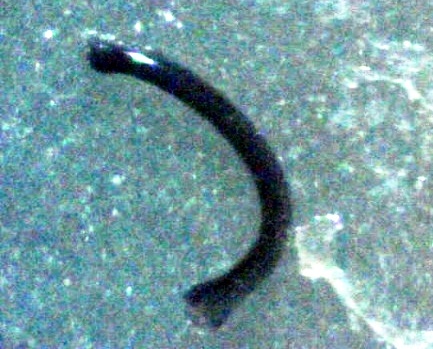 Black fibers are infrequent for me but others have them often. 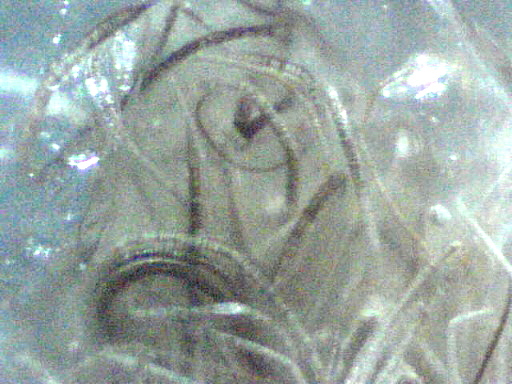 Sugar snakes start off with clear crystals on the outside that drop off as they move through the body.